1) After thinking about the setting of the Black-Blooded Earth, it's occurred to me that one of the elements I was planning to use is at odds with one of the major themes of the setting. So, no more portals or skyships. They conflict with the idea that there is nowhere to run if the world is rendered uninhabitable. 2) Over on Hill Cantons, there's an excellent series ongoing examining the domain game as presented in 1st edition AD&D. 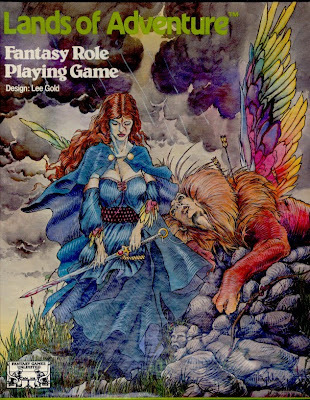 In addition, there's a discussion of what reading the situation as given says about the implied setting of AD&D. I have to consider this discussion and what it means for the Black-Blooded Earth, since I'll be running it with AD&D. 3) On that topic, I've decided that the house rules I outlined earlier will be the only ones in use that alter the rules as written. I may use other systems to cover specific situations that are not covered in the AD&D rules (material component availability and costs, for a notable one), but otherwise I'm sticking to the rules in the books and making up other stuff as it comes up (or grabbing a Dragon article as necessary). 4) Work continues on the Top Secret clone. Slowly, but it continues. 5) I'm considering several games for the next installment of Obscure Games. Should it be Fantasy Wargaming? I seem to be one of only two or three people in the world who like that game. How about Celtic Legends? High Colonies? The Arcanum? I have others in the offing, but one of those will be next. Let me know which ones you're most interested in hearing about. Over at Hack & Slash, -C is analyzing a session in which one of the players died due to grabbing some yellow mold. There's some very interesting and important discussion there about refereeing an adventure game that you should probably read. Especially important, I think, is this observation: "The rule is, if it can have an effect or is important, then it must be mentioned to the players." The temptation, as a referee, to leave out some crucial bit of information unless the players specifically ask for it is always present. That leads to the problem of pixel-bitching (the situation in which a certain magic phrase must be guessed and said by the players in order to successfully resolve a situation), and must be avoided. The rule that -C gives is one that should minimize that problem. Over the years, there have been a lot of games that have come and gone. Some of them are still around in various forms, but a lot of games have fallen by the wayside. The best of them (or at least, the most popular) become collectors' items and difficult to find. Here are some games that I missed out on getting, and would like to have. Buck Rogers XXVc - When this was around, I was in an anti-TSR frame of mind. It was easier to laugh at a TSR attempt at SF than to actually look into it, especially when my only real experience of the property was the campy late-'70s-early-'80s TV show. I have since learned that this was a pretty interesting setting, and the system was apparently not bad. Ah, well. Bunnies & Burrows - I was much too much of a "serious" gamer when I was a kid, and this was pretty much, conceptually, the antithesis of what I wanted. Yeah, I was dumb. The GURPS version was excellent (and I still have it), but I wish I'd had the presence of mind to get the original. Lords of the Middle Sea - A wargame from Chaosium, set in a future where the seas have risen about a thousand feet, and a significant portion of the midwest has collapsed (due to all the helium being removed, if I recall correctly). Based on a short story, the title of which eludes me at the moment. Super-cool setting, now hard to find for less than a hundred bucks. Skyrealms of Jorune - Although intrigued by the art and story bits in the advertising, I never got around to picking this up. Recently, a friend of mine showed me his copy, and I realized what I had been missing. Should have gotten it when I had the chance, years ago. Worlds of Wonder - Chaosium's boxed set was, in some ways, the first "universal" RPG. I kinda have this, actually, as I photocopied a friend's books, but I wish that I'd gotten a copy of this game when it was around. I hear that Magic World is being redone in the new BRP system, and I do have Superworld. Future World was pretty spiffy, sort of a prototype of Stargate. The universal city was an interesting idea. FTL:2448, Stalking the Night Fantastic, and Fringeworthy - The three games from Tri-Tac for sci-fi, horror, and another Stargate prototype, respectively. The system was unwieldy (and I think it was derived from Morrow Project, though the relationship was distant, as I recall) and the setting details were sketchy, but we had so much fun playing these in the '80s. I never got copies, though, and relied on the copies owned by the GM. What a mistake that was. At least I was smart enough to get the BTRC games that were (vaguely) similar, even if I don't think that I'd ever play them due to their complexity: TimeLords, SpaceTime, and Warp World. Dune: Chronicles of the Imperium - Actually, I did own this. Then I stupidly put it up for auction at GenCon (the last one in Milwaukee, and the only GenCon I've been able to make it to). Someone got a great deal on it, and I got shafted. Stupid, stupid, stupid. Ah, well, at least I have Burning Sands: Jihad. What games did you miss out on? Howard Robert E. - Conan series, Solomon Kane series, et al. Lee, Tanith - Flat Earth series, Birthgrave trilogy, et al. Llewellyn, Morgan - DRUIDS, RED BRANCH, et al. Lovecraft, H.P. - THE DREAM-QUEST OF UNKNOWN KADATH, et al. Sabatini, Rafael - CAPTAIN BLOOD, THE SEA-HAWK, et al. Smith, Clark Ashton - Averoigne series, Hyperborea series, Zothique series, et al. Vance, Jack - Dying Earth series, Lyonesse trilogy, et al. I guess I'd better get moving on that Top Secret retroclone. this is the best fantasy game cover to date. Too bad about the game. Fantasy Games Unlimited made some of the best games that no one played. This one is not one of their best, and is no longer in print, but it is full of good ideas presented badly. Lee Gold, the force behind the long-running and well-received fanzine Alarums & Excursions, as well as the Chivalry & Sorcery variant Land of the Rising Sun, which presented a highly-detailed, fantasy-Japanese culture just as its inspiration presented a fantastic Europe. With credentials like those, one would think that this game would be a slam-dunk. Unfortunately, it seems that Ms. Gold chose not to actually develop the game. It even reads like a set of notes rather than a set of finished and polished rules. Full of great ideas, the game leaves out a lot that would be necessary to actual play. Perhaps we could approach this like the Three LBBs of OD&D, but there's something else wrong here. It's more like the notes were never actually used in play before being thrown together and published. There are a few weird design decisions in the character creation rules. First, there are 11 basic stats. These alternate being created by the roll of a d20 and taking one of the other stats divided by 2 and adding a d10. So, we get CRAFT (or CRF), rolled on a d20, and then DEXTERITY (aka DEX), which is CRF/2 + 1d10. The strangest pair is APPEARANCE (APP), on a d20, and AGILITY (the unusual abbreviation AGY is used), which is APP/2 + 1d10 (justified as "gracefulness of movement"). My immediate inclination would be to change all of the d20 rolls to 2d10, but that's an aesthetic choice, I guess. There are different variations for "specialized characters" (who exchange magical TALENT, or TAL, for technological CRF or vice versa), technology level (higher tech improves CRF and diminishes TAL), or non-human characters. It is actually important to generate Height and Weight, for reasons that will show up in a moment. Next comes Piety. This is a measure of how much the character lives a religious life. Factors include the likes of "Attends major religious festivals", "Prays daily to deities", "Has Theology (a Knowledge Skill) at 76%+", "Per quest performed at deity's desire in the past year", and the like. It's not made clear whether missing a major festival once would eliminate that point of Piety (and would it come back at the next festival attended? ), and that's especially a problem for minor festivals. If a character engages in a Blasphemous Action, then the Piety will drop to a negative value and can no longer be improved without atonement (requiring a completed Quest per point of negative Piety). Blasphemous Actions range from "Refuses to admit a deity exists" on the low end to "Destroys a deity's Holy Place" at the extreme. As an example of the sketched-out nature of the game, the whole description of Piety (not counting the lists of Pious and Blasphemous Actions) is shorter than the paragraph I have just written about it. Next in the list of things to do in creating a character is figuring out the three kinds of hit points that a character has. These are Energy Points (EP), Body Points (BP), and Life Points (LP). EP are a combination of fatigue and magical power, determined by adding PRUDENCE (PRU), AGY, and STRENGTH (STR). BP are physical structural integrity, and are equal to the character's body weight in pounds divided by 10. LP are health and the strength of attachment of the character's life energy, and are equal to CONSTITUTION (CON). There's a quick note that EP are recovered based on the total of EP and LP remaining to the character, and that other healing occurs by transforming EP into other hit point types (at a ratio of 5 EP per LP or 2 EP per BP), with a chance of success based on the number of LP remaining (and no chance of healing if LP are 0). That's actually pretty clever, if a little convoluted and sketchily presented. Next up is some stuff about encumbrance and pushing things that are all labeled as optional. There's some notes on how quickly a character moves in the Movement Skills section, which is based on either the character's height or shoulder height (if a quadruped). In the section on Combat Skills, we learn that natural weapons do damage based on the character's BP (and so on the weight of the character). For instance, a Punch does 1xBP/10, while a Kick does 1xBP/8. Observation Skills includes some tables of distances in various conditions at which things can be perceived. Weapons do damage based on the weight of the weapon (only), while Missile weapons have a more complicated calculation involving an "efficiency factor", but the upshot is that an arrow does 7 points, the same as a 3.5 lb. sword. There's a brief note that there are critical hits and fumbles, with a reference to later combat rules. The armor rules are just strange. Instead of a simple subtraction from damage (or reduction of the chance to make an effective hit), armor multiplies the BP of the character. This is explained as easier than dividing the damage of each blow. I'll just leave it at that. In each combat Round (12 seconds), there are 6 Phases of 2 seconds each. An attack in a Phase costs EP based on the weight of the weapon compared to the character's STR, ranging from 1-5 EP. This can be reduced by taking an extra Phase per point of reduction. When damage is taken, the character taking the damage can choose to take up to half of it as EP, the rest as BP (or LP if out of BP). On a Crit, the damage is doubled and the character takes LP equal to half of the BP taken. There's also an optional rule for a Critical Hit Location table that gives specific effects. Magic is divided into four categories: Compulsions, Illusions, Enhancements, and Energy. Compulsions compel various behaviors or emotional states, Illusions affect senses, Enhancements improve various skills, and Energy has a number of relatively subtle physical effects (for instance, Energy can create an aura of damaging energy that only affects EP, can bind inanimate objects together, or can affect the intensity of other people's magical spells). There are guidelines given as to how to create spells of each type, giving the amount of EP that the spell requires and the difficulty of success with casting. Spell types can be combined as well to create more complex effects. One example given: MAGIC BINDING (Distant/Immediate Illusory Rope & Inhibit Escape), which is a combination of an Illusion and a Compulsion. Miracles are dependent on spirits, gods, and demons. A character with a high Piety and Miracle Skill category base chance is more likely to get the attention of an appropriate entity. However, there is another way of getting this attention, which is Thaumaturgy. This is basically a way of using Magic to Invoke a Deity through a special type of Spell. Diabolists are people who sell their soul (that is to say, their LP) to a Demon in exchange for power. Blah blah blah, animals, humanoids, skin shifters/weres. Dragons have ridiculously high BP and consequently base damage for their natural weapons, plus armor multipliers. Undead have no LP and so can't heal anything other than EP, but Ghosts (for instance) don't have any BP either. Vampires, oddly, don't seem to be able to heal BP at all. Anyway, that's a quick overview of the basic notes in the main rule book. There's more in the "Culture Packs". Only two Culture Packs were ever published for the game (and were included in the boxed set), for Mythic Greece and Medieval England. Lee Gold was apparently heavily influenced by Robert Graves, as a lot of the concepts in those two Culture Packs are from his works. So, like I said, a lot of neat ideas. Terrible presentation, and like OD&D there's a great need for the Referee to make interpretations of sections that are not really clearly discussed. This could be a good thing or it could be a bad thing, depending on the needs of a particular game. Since the setting is named for it, I thought that I'd discuss a little bit about what the Black Blood of the Earth is, in the setting. It is the necessary component of all magic. It is the way that internal states are transformed into external realities. It is the lifeblood of the land, flowing through the underworld like a vital fluid. OK, OK, so what does it do? In order to cast any magic, a magic-user (or illusionist, or cleric, or even druid) must imbibe a small amount when preparing the spell. About 1 fluid ounce per spell level is sufficient. This is not entirely cheap, however, as each fluid ounce costs (currently) 3 gold crowns, 18 silver nobles, and 8 copper wheels. This price fluctuates over time. My host in Belwick had a houseguest who harangued us all about the abuse (as he termed it) of the Black Blood. He claimed that the increasingly intense weather being experienced in the world is one result of the depletion of this vital planetary resource. No one, though, seems willing to give up magic for alarmist and unproven theories of that sort. This guest claimed that there are ways to continue to practice some magic, but that it can't be as ever-present as it is now, and that society will need to undergo drastic changes if it is going to continue without collapsing into chaos. Since he wasn't forthcoming as to what these "other ways" were, he was gradually ignored by the other guests. Most likely, though, he was talking about the Sun Elixir, which is a very expensive alternative to the Black Blood. It currently costs upward of 80 platinum imperials per fluid ounce, largely due to its slow method of manufacture (and the requirement for a long period of sunlight, which is just not practical in some areas). As a result, few people bother with it. In addition to being used to cast magic spells, the Black Blood is used to recharge magic items. Each fluid ounce will help to restore one charge to most magic items that have charges. It is also necessary to maintain long-term spells - such spells as Continual Light require a number of fluid ounces equal to the level of the spell per month (the first month is covered in the amount required to cast the spell) in order to keep functioning. Game designers have had a long tradition of setting the length of a combat round based on "feel". Rounds range from 1 minute down to 1 second in length. But how long should a round be, in order to make combat have verisimilitude? In a professional boxing match, a "round" is three minutes long. During an average round, around 70-80 blows are exchanged. That comes to about 1 blow per 2.4 seconds, or roughly 5 seconds per exchange of blows, on average. If you intend to make fighting specialists get more than one attack per non-specialist's attack, perhaps doubling that length would seem appropriate. Or, perhaps, lengthening the round length a little might work, say 6 seconds. If a round might be taken up by non-attack actions, then shortening it would be a good idea, relative to how many rounds would not include an attack. One of these days, I really need to learn what is the name of this world. I was in Belwick recently, and asked my host about religion in the city, and in the world at large. He explained to me that they recognize several types of beings that we would translate as "gods". There are the Transcendent Gods, which are very few, but whose followers are widespread. This is what most modern Westerners would think of as "religion", and it is only in these religions that there are Clerics. In Belwick, the dominant Transcendent church is the Quaternary Church, which worships four gods: Jin, the Salamander King, Niksa, the Undine Queen, and their children, Ghobe, the Gnome Prince, and Paralda, the Sylph Princess. There is, however, a small temple to another Transcendent god, the Fatalist Church, which worships Arachne, the Weaving Goddess of Fate. The Transcendent Gods don't generally act directly, but instead through their Clerics and their angelic messengers (Solars, Planetars, Devas, Ki-Rin, and so forth). Next are the Immanent Gods. These are more like the traditional RPG gods, but without the ability to provide spells to Clerics. Their priests are Druids, whose magic comes from the circulation of brí, which is the underlying force of the universe. Like the Force of Star Wars, it surrounds and pervades everything in the universe, binding it together and giving it form. The Druids and their congregations make alliances with the Immanent Gods, rather than gaining the ability to cast spells. In addition to Druids, some magic-users have developed spells to contact Immanent Gods, which they use to forge alliances with these powerful entities. Immanent Gods also include entities like Primus, the Prime Modron, Bahamut, the Platinum Dragon, or the like. Basically, like demons, but not actively malicious. Third are the Demon Gods. These are the demons and devils (and daemons and slaad and so on) of the RPG. They have no priesthood, but interested magic-users can summon them with spells like Cacodemon, and command them by threatening spells like Spiritwrack. Finally are the terrible cults of the Outer Gods. These are four gods (and numerous demonic lesser Outer Gods) which exhibit an extreme indifference to humanity. The four central Outer Gods may be Transcendent Gods of a sort, but they do not provide powers to Clerics. The only worshipers of these terrible entities are insane magic-users who seek the power they imagine that they can wrench from these forces. Or, at least, that is how it was presented to me by my host. I notice, however, that there are quite a few magic-users highly placed in the city and provincial governments who attempt to make pacts or other deals with the Outer Gods.